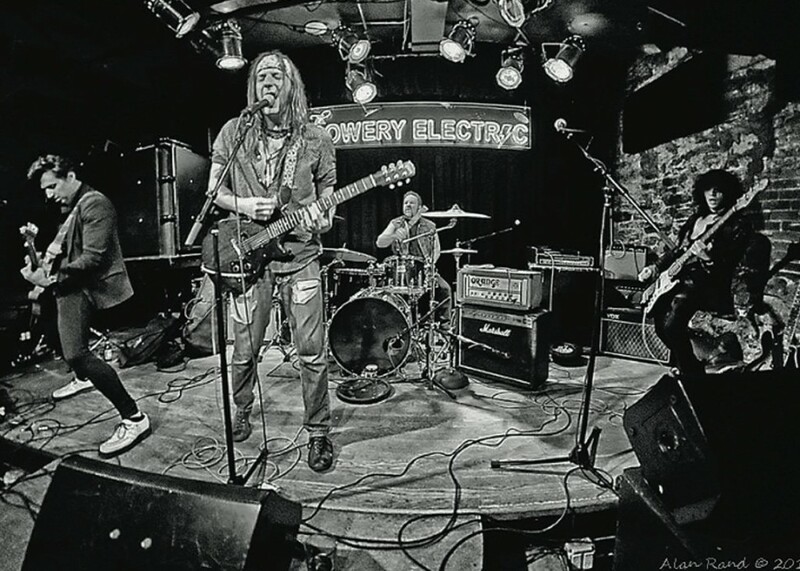 Charismatic rock band THE SWEET THINGS is what your ears have been craving. Their reckless, raun- chy spirit celebrates unabashedly doing your own thing. That’s cool. And that’s THE SWEET THINGS. The boys are hot off a sold out show in Brooklyn with underground leg- ends Toilet Boys, and are currently in the studio cooking up some more. Make sure to link up with them on social media so you don’t miss the next party! of Bellevue (a psychiatric hospi- tal). To be honest, nobody knows where he’s from I think (laughter all around). Q: Tell me about your sound and the band’s influences. LORNE: I think for all of us, punk rock was a water shed for our entrance into music, and then we all found different threads which influenced us— like American roots music, which we attacked with a punk rock drive. 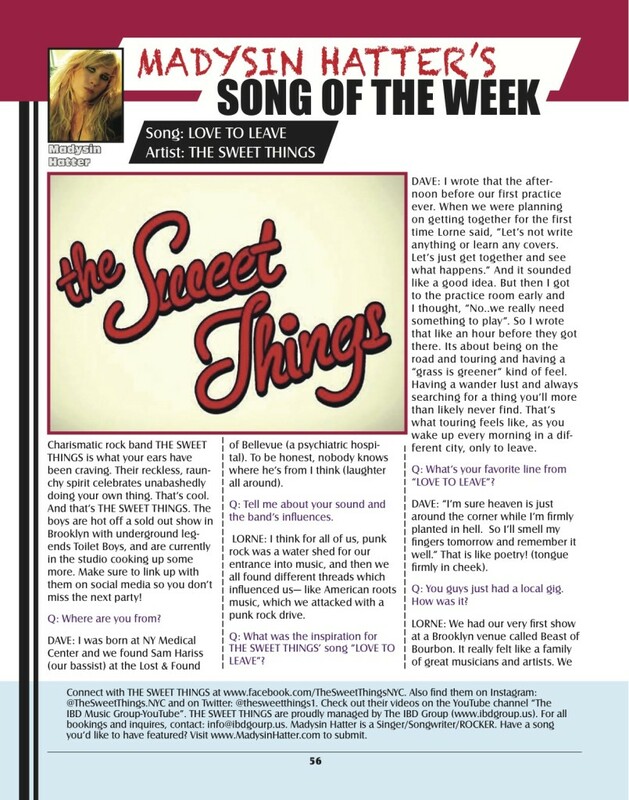 Q: What was the inspiration for THE SWEET THINGS’ song “LOVE TO LEAVE”? I thought, “No..we really need something to play”. So I wrote that like an hour before they got there. Its about being on the road and touring and having a “grass is greener” kind of feel. Having a wander lust and always searching for a thing you’ll more than likely never find. That’s what touring feels like, as you wake up every morning in a dif- ferent city, only to leave. Q: What’s your favorite line from “LOVE TO LEAVE”? DAVE: “I’m sure heaven is just around the corner while I’m firmly planted in hell. So I’ll smell my fingers tomorrow and remember it well.” That is like poetry! (tongue firmly in cheek). Q: You guys just had a local gig. How was it? LORNE: We had our very first show at a Brooklyn venue called Beast of Bourbon. It really felt like a family of great musicians and artists. We recently had the opportunity to re- turn and play there New Years Eve with an all star line up of excep- tional musicians. DAVE: It was a really fun show. And in this case I see it as a foreshadowing, because in one hundred years they won’t be singing “Auld Lang Syne”. They’ll be singing a SWEET THINGS song! Q: What’s next for you guys? What do you hope to accomplish in 2016? THINGS were some of the best songs I’ve ever written, or been a part of writing with the band. LORNE: We plan on going back into the studio to record a few more songs and put them out there. You know, we came together pretty fast and we’re just starting to find our union in regards to songwriting. So I’m just looking forward to exploring that more and to grow as a collective.